January 21, 2014 – Hi everyone! It’s Ali back with you today from Gimme Some Oven, and I’m stoked to be sharing one of my favorite game day recipes with you — custom mini pizzas! I live in Kansas City, so it pretty much goes without saying that on Sunday afternoons, the entire city is gathered around TVs everywhere to cheer on our team. But with great games must come great food! And since people end up spending so much time gathered around the kitchen on game days anyway, why not involve them in the cooking? Enter one of my favorite treats to make — custom mini pizzas! I mean, let’s be real. Everyone loves pizza. And everyone has their preferences about exactly what kind of pizza they prefer. So next game day, try setting out a DIY custom pizza bar so that they can make their own! It’s super easy. And when made with ALDI ingredients, it’s also super affordable. All you need are some pre-made (or pre-chopped) toppings, pizza sauce, shredded cheese, and pre-made pizza crusts. I often grab some English muffins or pita bread from ALDI to make super easy crusts. But you can also make traditional homemade pizza crust, or for a healthier and gluten-free option, I have also included a recipe below for cauliflower crust. Lay out pizza crusts on a parchment-lined baking sheet. Spread a spoonful or two of pizza sauce over the top of the crust. Layer with desired toppings, then sprinkle with cheese. Bake for about 10-12 minutes, or until the cheese is melted and the crust is slightly crispy or golden around the edges. Remove and serve warm. Transfer 1/4 cup of the cauliflower mixture onto a parchment-lined baking sheet, and use your hands to flatten the mound into a thin round pizza crust. Repeat with remaining cauliflower crust. Bake at 450° for 15 minutes, until the center of the pizzas are cooked and the edges are slightly browned. Continue with recipe above as directed. I love to make homemade pizzas! Sometimes I’ll cheat a little and buy the Aldi Fresh Cheese Pizza and add my own veggies/chicken. It’s hard to beat a Large Pizza for $6!!!! Thanks for the gluten free options! Would LOVE to see more gluten free choices/ mixes at my Aldi’s in Wichita KS. 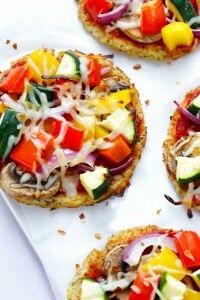 Love the cauliflower crust idea, Yummy Not sure if the men in my family would go for it, it sounds wonderful to me. I have to agree with buying one of the ready made pizzia and adding extra toppings, my son and I did that last week, I ate one piece and added a nice salad and fruit and it made a wonderful meal and I stayed within my calorie goal for the day. Ali: Regarding the cauliflower crust, why would you add the egg and THEN squeeze out the excess water? Wouldn’t you squeeze-dry the cauliflower first then add the egg? Also, could I substitute Nutritional Yeast for the Parmesan? Gramma Lu — you can go either way on straining before/after. And big yes on the nutritional yeast — that would be tasty! Does Aldis carry parchament paper? Another way to utilize Aldi Gluten Free Pizza Crust Mix and Aldi Gluten Free Cornbread Mix… these will make the following recipe twice. Note: Pizza Crust Mix is not dairy free! I’m paying the price of taking the risk 🙁 I sincerely wish this mix was dairy free! The following recipe is a winner, in my book for taste and texture, otherwise. In a glass mug or bowl, pour together milk and water. Microwave at medium low for 1 minute. Test mug/bowl bottom against inside of wrist to be sure it’s just nice and warm (like a baby bottle) or use a thermometer: max 110 degrees! Add yeast and olive oil, stir gently to dissolve. Set aside to allow yeast to proof. In a mixing bowl, add the measured dry ingredients, gently stir to mix. Add proofed yeast mixture, stir until well blended. Scrape sides and bowl bottom a few times to get all the dry ingredients. Cover, set aside in warm, draft free area to rise. Prep all toppings as desired. Prep sauce or use a prepared sauce. Prepare 2 – 12″ round baking stones. Mist stones with olive oil (holds parchment paper), lined with parchment paper (Aldi), sprayed with olive oil again. Dust with extra cornbread mix. Scoop half of the dough onto each prepared stone. Using oiled wax paper, lay on top of dough, roll out with dough roller. Move wax paper as necessary. Roll crust until consistent thickness/thinness. Set aside in a warm, draft free area to rise for 30-60 min, as desired. Gently add sauce and toppings. 1 – 2 avocado mashed, mixed with one – 4 oz plain goat cheese (Aldi). Dilute, as necessary with Almond milk/water to make sauce like. Mix in boulder blender if needed to create smooth sauce. Add seasonings, as desired. Sausage and ground beef (both precooked and drained); turkey bacon (aldi, precooked); fresh sweet pepper, tri-color, cut into strips; fresh broccoli, flower-lets cut into thin fans; grated carrot; mushrooms, cleaned, and sliced; sliced olives, and 4 oz plain/honey goat cheese cut length wise and then sliced. Seasoned with basil and parsley. Please do not publish my email! Thank you!